Google says all three generations of Pixel phones will soon be able to take advantage of Night Sight, Google's new low-light photo feature. Night Sight uses several techniques at once in order to improve the chances of capturing a successful shot in dark environments. Night Sight continually adapts to the movement of the Pixel phone and the surrounding light. The software is able to measure hand shake and motion in the scene to find the right exposure. Google says when the Pixel is held still, Night Sight will take longer exposures to minimize noise, but if the subject is moving Night Sight will use shorter exposures to minimize blur. Night Sight can compensate for some amount of motion in the shot by firing off a burst of photos and then merging the results to provide a bright, sharp photo. Night Sight also uses machine learning to balance color and create true-to-life images. 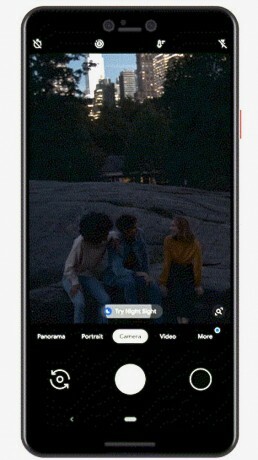 Pixel phones will automatically suggest Night Sight when they detect low-light conditions, though users can also turn the feature on manually. Night Sight will be rolling out over the next few days through an update to the Google Camera app.